Is this a common sight in your house? Every time I look in the fridge there’s a half eaten bowl of fruit staring me in the face… and taking up valuable fridge real estate! 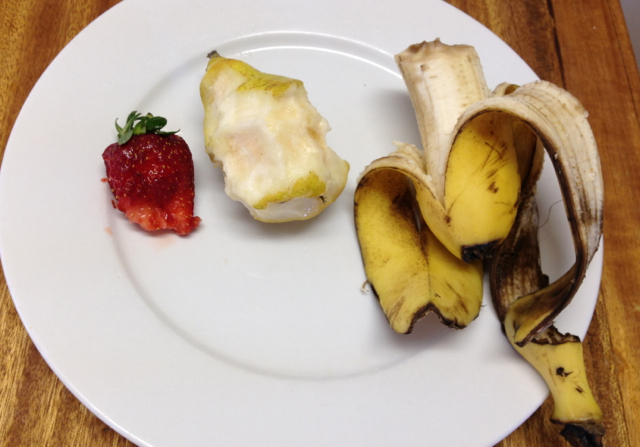 I tried everything: cutting up a piece of fruit so the girls could share it (that only resulted in a bowl of half eaten cut up fruit left in the fridge); putting left over fruit into a smoothie (resulting in half drunk smoothies left in the fridge) …. this baffling little bowl of scraps took many forms and I thought its fruity reign would never end. … and my world changed. FOREVER. 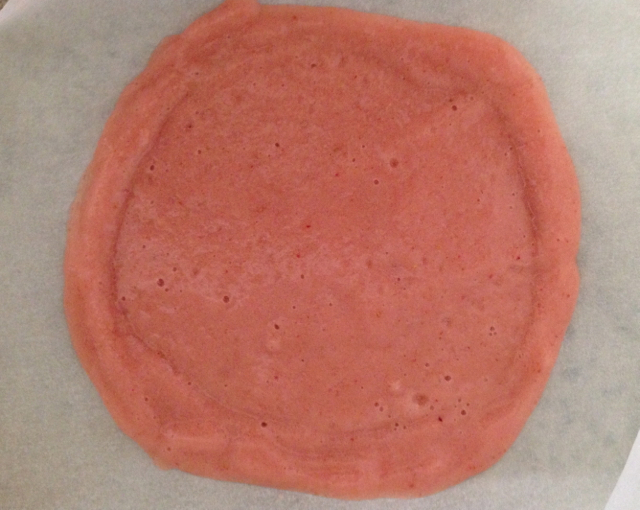 Fruit leathers are pureed fruit, spread out over some baking paper and dried very slowly to take out all the moisture. They’re basically like the store bought fruit roll-ups you got as a kid without all the added sugar and preservatives. They’re delicious and get rid of all the half eaten, left over, and over ripe fruit in the house – they’re amazing! You can really get creative with them, too. Drizzle yogurt on them; sprinkle nuts or shredded coconut on the top to give them added texture; combine vegetables like baby spinach with the fruit to make a super-green-smoothie-roll-up… there are so many options! But I don’t have a dehydrator! I know what you’re probably saying “I don’t have a dehydrator, I can’t do this “. Well, in fact, you can because it’s very easy to use your oven as a dehydrator for this particular snack. 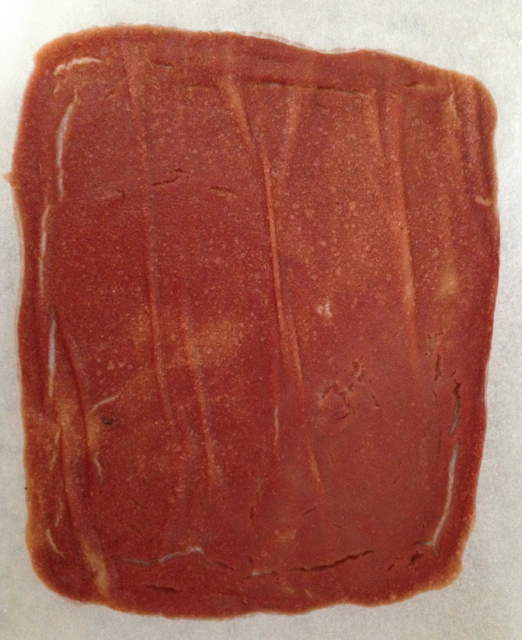 To show you how, I made two batches of fruit roll-ups: one in the oven and one in the dehydrator. I’ll go through the ingredients and instructions in more detail below but first I’ll go through the details of how I get my oven to work as a dehydrator. 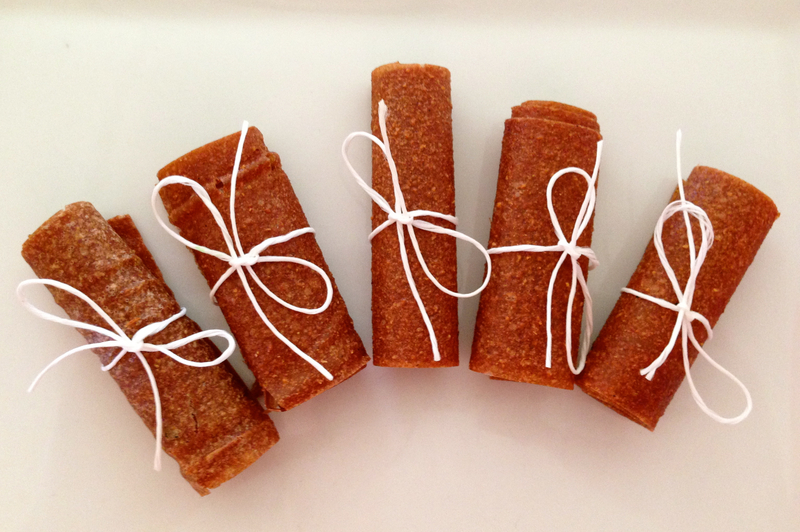 First of all preheat your oven – I didn’t and my first batch of roll-ups turned out like this. You will need to set your oven very low (around 57 degrees celsius), and turn your oven’s fan on if it has one. Leave your oven door slightly ajar – I use a wooden spoon to keep the door open just enough to allow some air flow. Leave your oven on for a while to make sure it’s properly pre-heated. It’s a bit harder to control the temperature for dehydrating in an oven (which is why I bought a dehydrator) but it can be done! I left my oven for a about 30 mins then checked it every 5 – 10 mins to make sure it was staying the same temperature. You can check the temperature by sticking your hand in the oven. It should feel very hot in there but not so much that it burns you. Think mid 40 degree Summer’s day + wind and go get yourself a cold drink… it’s ready! The one that came out of the oven was slightly creased in places from where the baking paper crinkled up when it heated. You could probably fix this by using microwavable cling wrap, but I’m a bit iffy about heating plastic in the oven where the temperature may fluctuate. Once it’s cut and rolled you can’t tell anyway. A teeny word of advice before you start: these take 4 – 6 hrs to “cook” depending on your oven. The first time I ever made these was on a day I was at home with the girls. Once you’ve got the hang of it, put these on before bed and dream of chewy deliciousness. They should be ready by morning. Preheat oven to approximately 57 degrees celsius. 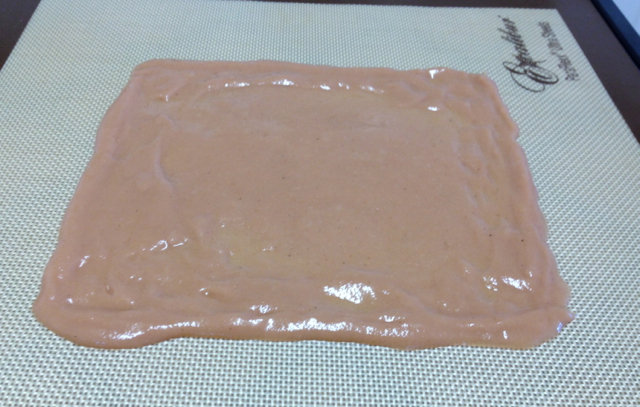 Line a baking tray with baking parchment paper. 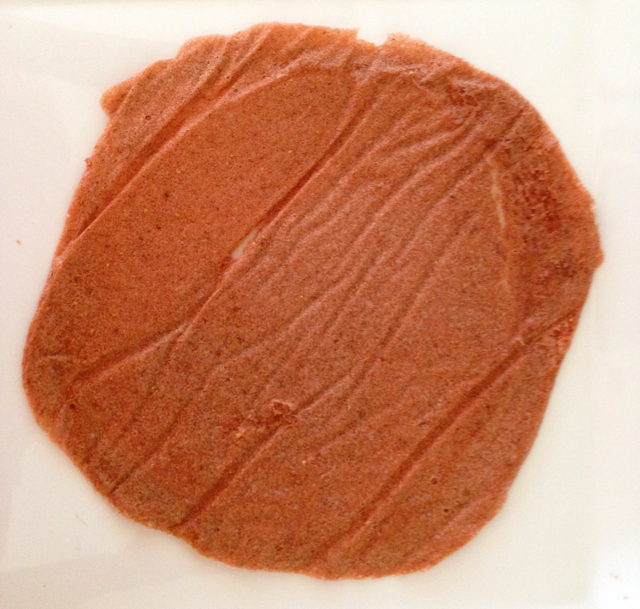 Pour your puree into the middle of the baking paper reserving a few tablespoons of liquid. Spread out the puree by using a spatula or by holding the baking tray in your hands and moving it from side to side so that it spreads evenly. It should be approximately 3mm thick. 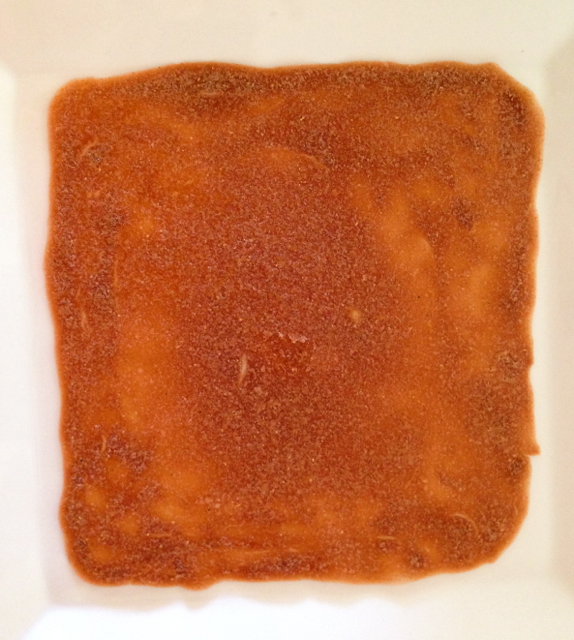 Take your reserved puree and, using a spoon, build up the outer edges so that they measure about 6mm thick (see photos above). This is so the edges of the roll-up don’t dry out too quickly and become brittle. Dehydrate for 4 to 6 hrs until no sticky spots remain. Carefully peel the roll-up off the baking paper. It should peel off easily. If any puree adheres continue dehydrating. Allow to cool. Cut strips out of roll up with kitchen scissors and wrap in plastic wrap. Store in airtight containers in a cool dark place or fridge.